Collins Booksellers - Badgered to Death by Dominic Dyer, 9780993040764. Buy this book online. Dominic Dyer picks apart the science and electioneering behind Britain's most controversial wildlife policy: the badger cull. He exposes the catastrophic handling of bovine TB by the UK government, the political manoeuvring that led to the cull being devised in 2010, and the ongoing close relationship between its two instigators in Britain — the National Farmers Union and the Department of the Environment, Food and Rural Affairs (DEFRA). He shines an unflattering spotlight on Cabinet ministers, the veterinary profession, environmental NGOs Greenpeace, Friends of the Earth and WWF, and the BBC, accusing them of doing too little to protect a protected wild species. *'For many reasons we had come to love the badger, to cherish and admire it, to protect and celebrate it and of course many still do. 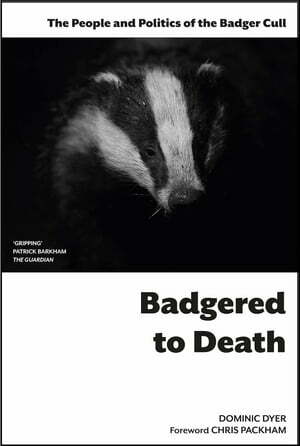 *'A thriller, whodunnit and impassioned polemic, this is the inside story of the badger cull. It should be read by all those battling against government policies that put money ahead of science and the environment.Our natural world is too important to be over-ridden in this way.